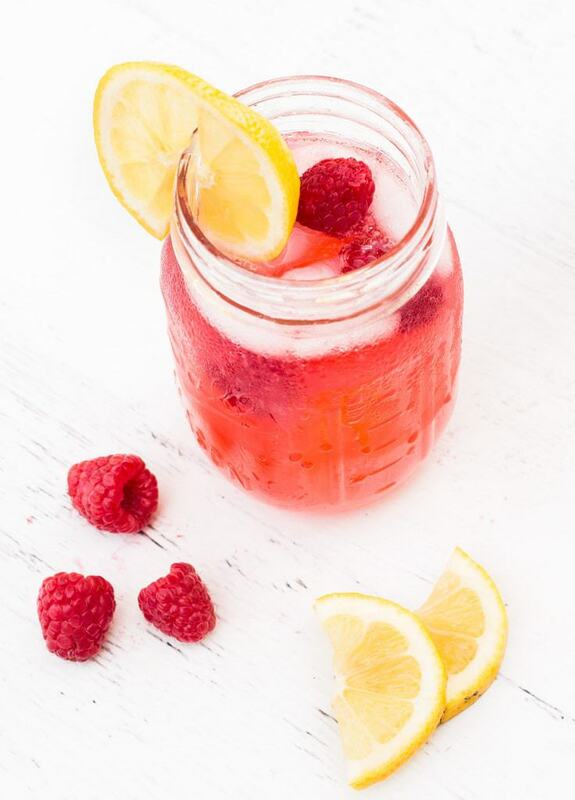 Try this raspberry lemonade recipe this summer! It is light, refreshing and made with ripe raspberries. The recipe makes a colorful drink to enjoy in warm weather! 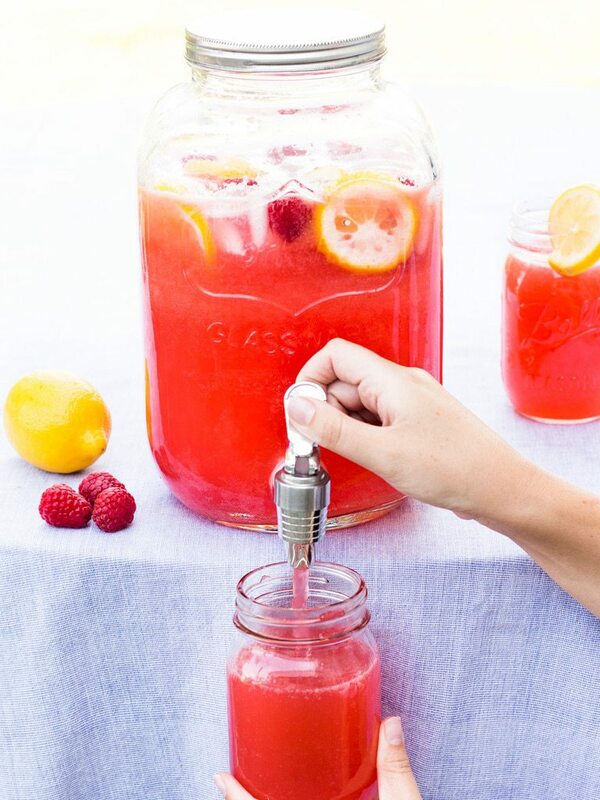 Summer is still going strong and to beat the heat I’m sharing a raspberry lemonade recipe. 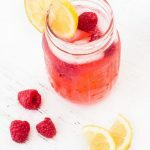 Made with raspberries right from my garden, this drink is incredibly refreshing—just what you need on a warm summer day! 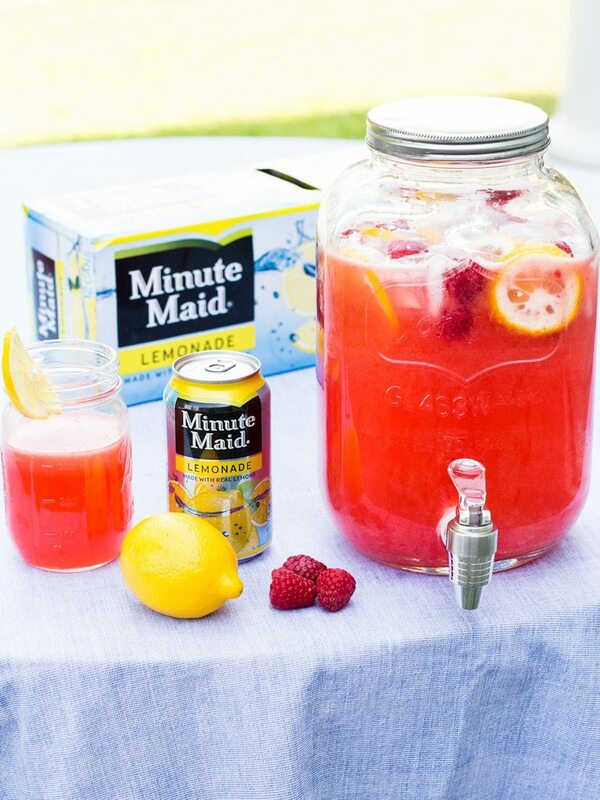 Raspberry lemonade is bursting with bright colors and flavors to match. I used Minute Maid® Lemonade as the base for my drink and added homemade raspberry pureé to create a natural pink color. Raspberries are one of my favorite summer berries. Growing up, my parents’ had a giant raspberry bush in their backyard. When my brother, sister and I were playing outside we would eat the berries right off the bush! Another childhood memory that I have (and I’m sure many of you do too) is having a lemonade stand. My parents would help me and my siblings set up a stand and sell lemonade to our neighbors. That thought inspired me to invite people over for a spur of the moment get together. I set up a makeshift lemonade stand on my patio and spent the summer evening relaxing with friends and family! The pitcher of raspberry lemonade was set it up on a table for guests to serve themselves. Raspberries and lemon slices were also on hand if anyone felt like garnishing their drink! The drink recipe was quick and easy to make too. I used raspberries from the garden to make the pureé and stirred it in with Minute Maid Lemonade and seltzer. I find that the seltzer cuts the natural sweetness of the raspberry pureé while adding a subtle fizz in each sip. Summer is slipping by quickly and I’ve been trying to pack as much in as I can (hence the impromptu summer soirée with friends). The busy schedule inspired me to try Peapod to buy my groceries and save time. 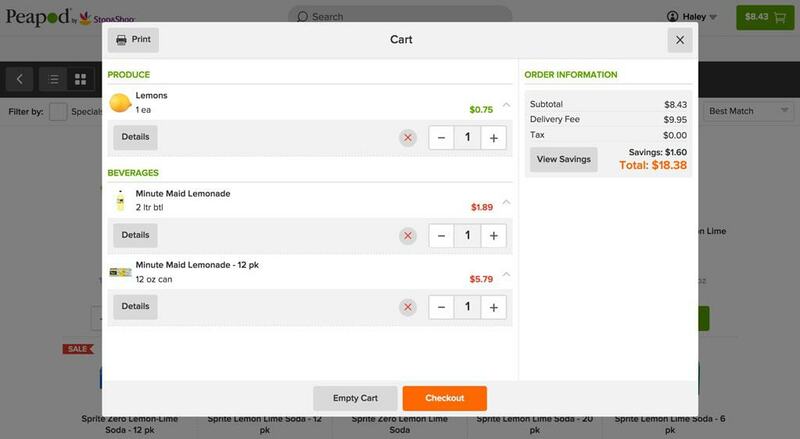 I found the ingredients for my raspberry lemonade recipe as well as a few other things I needed and added them to my cart on the website. 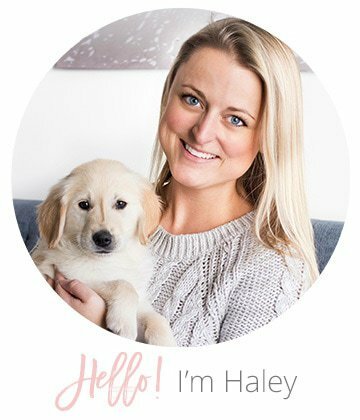 It was so easy to use (I provided a screenshot below the recipe card) and everything was delivered right to my door! It made my party planning process a breeze. 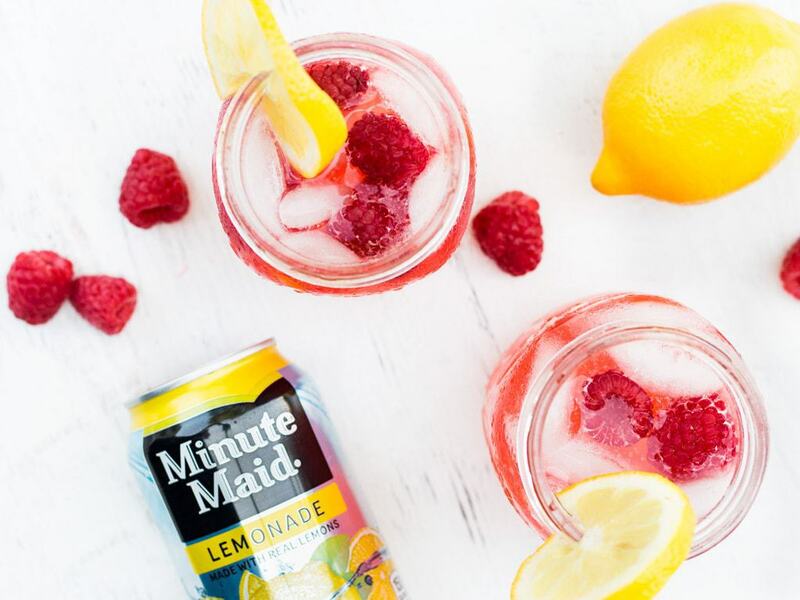 If you’re in need of a refreshing summer drink that is ready in minutes, this raspberry lemonade recipe is for you! Enjoy it with friends and family on a warm summer day. In a food processor or blender, pureé 1 1/2 cups raspberries. Using a rubber spatula press the raspberry puree through a fine mesh sieve into a medium bowl. Set aside. 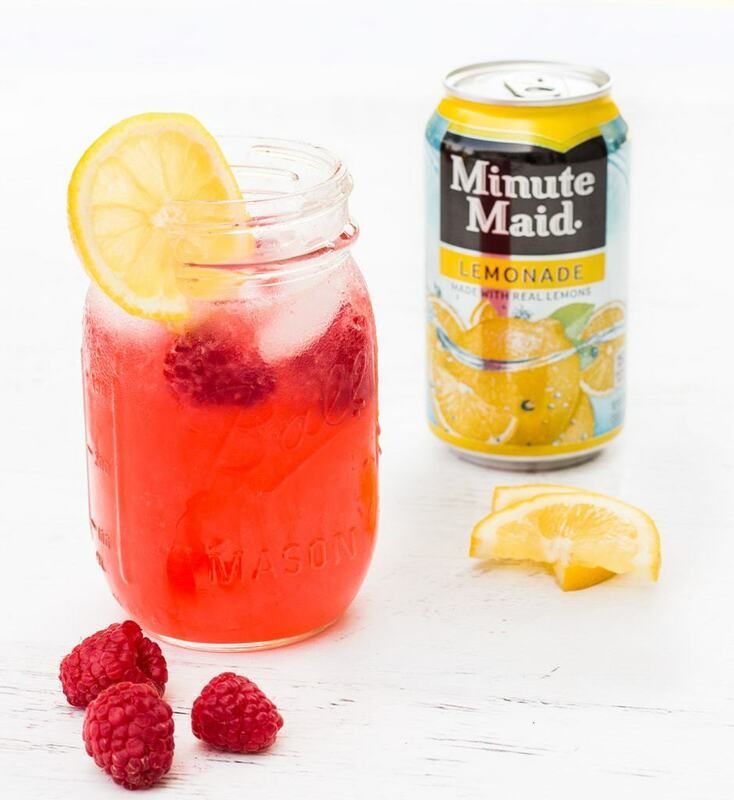 In a large pitcher (my mason jar drink dispenser holds 2 gallons), pour in Minute Maid® Lemonade, seltzer and strained raspberry pureé. Stir and pour into glasses filled with ice. Garnish each glass with additional raspberries and a lemon slice. 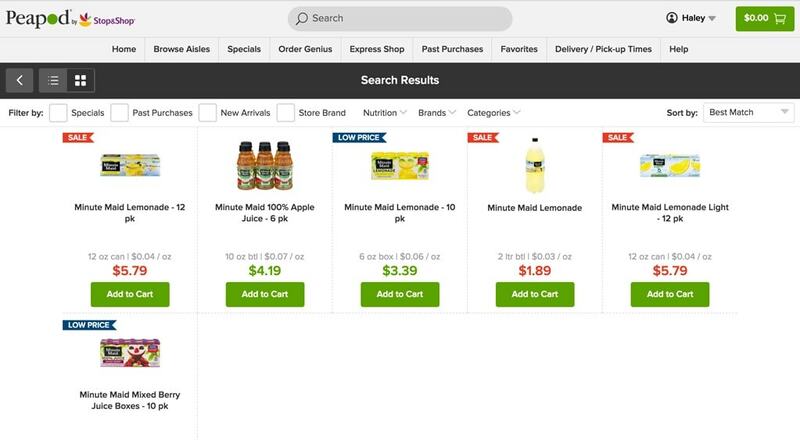 Here’s a glimpse at the Peapod website… Simply search for what you need and add the item(s) to your cart. 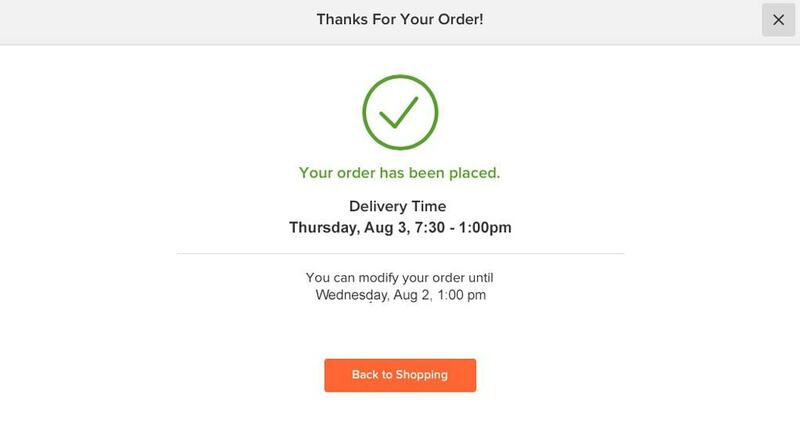 Plus, you can receive $20 off your first order and 60 days of free delivery the first time you try Peapod!